Black skin is amazingly beautiful and taking good care of it is going to lower the risk for the ashy look and the unhealthy appearance. How to choose a good lotion? It’s not only the natural beauty that we all love about the black skin, but also its strengths. For instance, the black skin it thicker which means the fine lines and wrinkles are going to show pretty late in life. Therefore, you don’t need lotions that reduce premature signs of aging as the black skin doesn’t have this problem. Another good part about having a thicker skin is that the sun’s bad UVs rays are less likely to damage the black skin. However, the black skin isn’t entirely immune to sun’s rays so it still needs sunscreen or lotion with good broad spectrum. Nevertheless, skin cancer isn’t that common for the black skin. Hyperpigmentation is a problem for the black skin which is why it’s necessary to use cosmetic products that address the problem too. Black skin is prone to dryness and acne, which means you need to use lotions that moisturize and hydrate the black skin, without causing acne. Shea Butter, cocoa butter and vitamin E are the most efficient ingredients to look for on a lotion for the black skin. They are able to hydrate and moisturize the black skin, without causing any side reactions or making it too oily. No matter what your final choice is, pay attention to your skin reactions as skin reacts differently. As for the price, the price range is pretty good and it’s impossible not to find a lotion that matches your wallet. 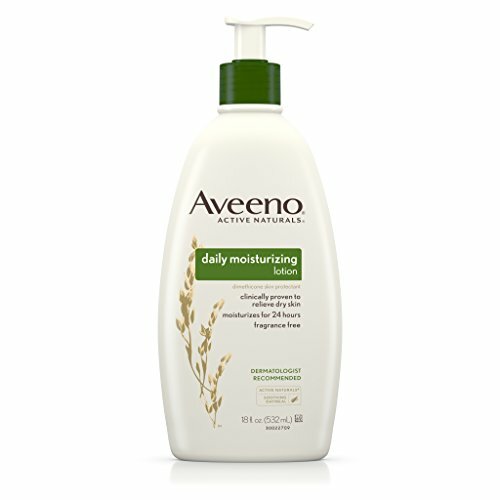 1.A valid option for the tight budget is the Aveeno Daily Moisturizing Lotion for Dry Skin that manages to hydrate and moisturize a dry skin, black skin including. The lotion has an efficient formula that leaves the skin moisturized for 24 hours. Even though it works, the lotion is quite gentle and doesn’t cause skin irritations. Additionally, it works for eczema too as it doesn’t lead to itching. The formula of the lotion is based on the soothing oatmeal that is well-known for its calming effects on the dry and sensitive skin. The lotion also contains rich emollients that protect and sooth the dry skin for 24 hours straight. Your skin remains soft and smooth and healthier looking when using the lotion. It’s not thick nor greasy, either. It’s a non-comedogenic lotion that absorbs really fast into your skin. The lotion is scent-free and very clean. It doesn’t transfer and combines well with other skin products. Due to its gentle formula, the lotion may be used on face too. It’s low priced so it checks so many boxes when it comes to price and overall value. Nevertheless, for the money you’re paying, the lotion is a good choice for the black skin, as it moisturizes for 24 hours. 2.If you’re sitting on the fence about Nivea, come down with it and give it a chance next time you’re in need. The NIVEA Essentially Enriched Body Lotion is the perfect example of who Nivea manages to create a nice surprise, for the whole family. The first thing to strike you is the lovely smell of the lotion that isn’t strong and does fade away pretty fast. At glance, the lotion has a rich and buttery texture but doesn’t sit long on the skin. By contrary, the lotion does absorb pretty fast into your skin. Even though it’s rich, it doesn’t leave a greasy feel onto your skin. The formula is great as it nourishes the skin as it’s based on natural sea minerals and almond oil. It also contains Vitamin E which is why it hydrates so well the black skin. It reduces dryness and makes your skin look better after a while. It’s safe to use for everyone in your family too and the risk for allergies is minimal. Your skin gets softer and smoother when using the lotion. Some noticed how the skin evens your skin tone, making it look younger and healthier. The lotion leaves a nice glow to the skin, but has no tacky feel. It soothes the skin and doesn’t clog pores. A little goes a long way and the lotion is a great choice for the entire family. Nevertheless, as it’s hydrating and leaves your skin lovely scented and moisturized, the lotion is a nice choice for everyone in your family. 3.Pamper your skin with a fancier body lotion like the Clinique Deep Comfort Body Lotion. The lotion has a rich and creamy consistency, but this doesn’t stop it to soak right into your skin. If you’re dealing with dryness-prone skin (knees, heels or elbows), the lotion is a great option as it’s strong enough to soothe skin right away. It moisturizes your skin and leaves it soft and smooth, no matter how dry it used to be. The lotion has a fresh and clean scent that isn’t very strong. It rubs nicely into your skin, without leaving a greasy or slick residue. It rejuvenates your skin and is a safe choice for the sensitive skin too. The formula of the lotion is highly efficient and some got great results when using it against the stretching marks from birth. The lotion is yet gentle enough for calming eczema, causing no skin irritation at the same time. The lotion comes in a good size bottle that is very easy to store. The pump eases the use and the lotion gives your skin a healthy natural glow. RELATED POST: Picking at Your Breakouts? Here’s Why You Should Stop! For what it’s worth, as long as you’re willing to pay the extra buck, the lotion hydrates and moisturizes the black skin, leaving a healthy and luxurious feel afterwards. Read the full review. 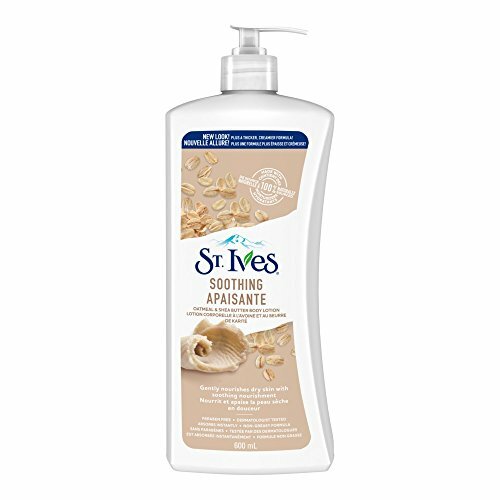 Based on the calming oatmeal and Shea Butter, the St. Ives Soothing Body Lotion, Oatmeal and Shea Butter nourishes your skin, leaving it softer and healthier looking. Due to its gentle formula, you may safely use it on both face and body, but you need to pay attention around the eyes as it may burn the eyes. The lotion is made with 100% natural moisturizers like soybean oil, plant based glycerin and so much more. The formula also includes shea butter which is loaded with Vitamins A, E and F, but also fatty acids that moisture a dry skin. The lotion is rich and creamy, but hydrates the skin without leaving a greasy feel. It absorbs fast into the skin and leaves a clean and warm scent. A little goes a long way and the lotion is easy to spray. It’s better not to spray it directly on your face though, but on your hands first and only apply it on your face afterwards. The lotion is a safe choice for the sensitive skin as it’s hypoallergenic and non-irritating. You should use it twice a day for better results. If you’re struggling with eczema, the lotion is safe to use. The oatmeal inside the formula soothes itchiness and brings comfort to an irritated skin. Easy to use and efficient, the lotion comes with an attractive price too. All things considered, as it’s safe and nourishing for black skin, the lotion is money well spent most of the time. 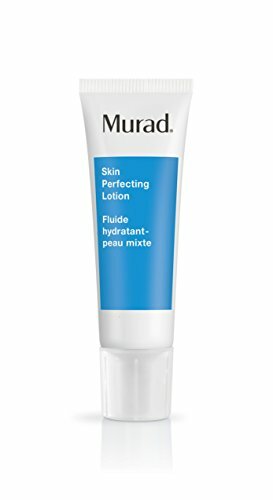 Even though the Murad Acne Control Skin Perfecting Lotion doesn’t come cheap, you shouldn’t hesitate when in need for an efficient face lotion for your black skin. The face lotion is a great choice for the blemish-prone skin and clears it efficiently, leaving it smooth and healthier looking. It provides an oil-free hydration and it’s lightweight enough to be used right under your makeup. The non-comedogenic moisturizer lowers the risk for breakouts and calms skin irritations. It controls the oils within your skin and makes your skin soft and nicely looking. The face lotion is lightweight and has a subtle scent that doesn’t linger onto your skin. It clears up the pores and tightens them, preventing future clogging as well. Taking a look at its formula is going to help you better understand its efficiency. The face lotion is made with panthenol and honey extract that hydrate the skin, whereas allantoin and arnica calm the skin. As for the retinol and queen of meadow extract, they’re going to minimize oil production, refining the pores at the same time. The face lotion isn’t heavy and leaves your skin soft and supple. All things considered, the face lotion works great for an acne-prone skin, getting in control with the oils with your skin too. You can also read the full review. If you’re looking for a lotion that is based on cocoa butter, put your trust and faith in the Palmer’s Cocoa Butter Formula Lotion Fragrance Free. The formula is a great option for the rough and dry skin and eliminates for good the itchiness in the most prone to dry areas: elbows and knees. It’s a nice solution to have in mind when trying to reduce the appearance of scars too. Soothing a dry and irritated skin, the lotion soaks right in and doesn’t clog pores. Its scent is subtle and nice and the lotion doesn’t leave a greasy feeling. It fades scars and heals a rough skin. A little goes a long way and the lotion comes for a good price, too. Regardless of the minor problems, the cocoa butter lotion still moisturizes and soothes a dry and sensitive skin, as black skin is one in many situations. 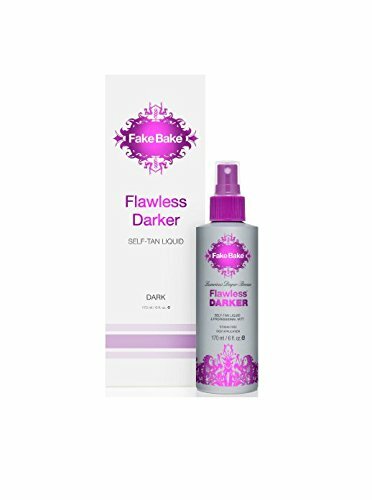 As long as you’re aware that the efficiency of a tanning lotion relates a lot to how well you’re preparing the skin, you may get the best out of the Fake Bake Flawless Darker. Popular and highly appreciated, the lotions come with a gorgeous brown natural color that fades away naturally. The lotion is made to match all skin types and it’s a great way to tan your skin without the damaging effects of the sun. The spraying lotion is fairly easy to use, but you should start with an exfoliation. It dries pretty fast and doesn’t transfer. However, if it does stain the clothing or the sheets, it’s very easy to wash it off. The lotion has a natural color and no orange hue in it. It doesn’t have a bad odor and its scent is rather subtle and nice. Easy to apply, the non-sticky formula comes with a tropical scent that doesn’t linger for long. The tan is going to take from 4 to 6 hours to show. One application is enough for results. It evens the skin tone and doesn’t leave any weird patches. It doesn’t dry the skin and it’s easy to blend for even results. However, for its beautiful color and easy application, the lotion is worth to try whenever in need. 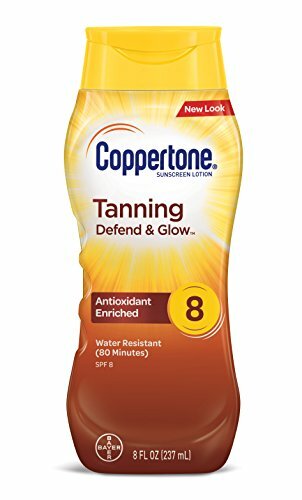 For the darker skin that isn’t looking for a strong sunscreen, but for a suntan lotion that protects the skin from sunburns, while allowing some of the sun rays to tan the skin, a reliable and safe choice is always the Coppertone Tanning Defend & Glow Sunscreen with Vitamin E Lotion SPF 8. The lotion has an efficient formula based on antioxidants so it moisturizes the skin, while keeping some of the UVs at distance. The texture is nice and the lotion is lightweight, soaking fast and easy into the skin. Its formula also includes aloe and Vitamin E, which explains its consistency and moisturizing ability. The lotion doesn’t leave a greasy feel onto your skin and covers well. It’s easy to use and it’s not heavy at all. Its effect lasts for long and the lotion is a safe choice for many skin types. It comes in a good size and the price is a great reason for you to give it a go. It leaves your skin smooth and protected from the sunburns. Additionally, the lotion handles water pretty well and it protects you for 80 minutes or so when going in and out of water constantly. As long as you’re interested in a low-priced suntan lotion that works great for your skin, you’re not far from the perfect choice with this one. 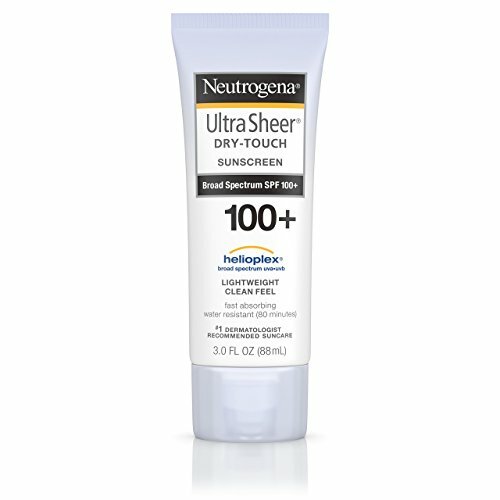 One of the most popular choices to use over the summer on the black skin is definitely the Neutrogena Ultra Sheer Dry-Touch Sunscreen, Broad Spectrum SPF 100. Not only the lotion presents an astonishing 100SPF, but it also manages to protect your black skin without leaving any white or grey residue on it. It’s made with Dry-technology so it gives a nice finish to your black skin, without the unpleasant shine that you’d typically get from many lotions. The cap snaps right open every time so you shouldn’t worry about using it or having difficulties opening it. The size of the recipient is quite small so it’s easy to throw it in your bag when going for the day to the beach. The lotion is rather lightweight and covers well. It blends nicely and doesn’t leave an oily feel to the skin. It soaks immediately into your skin and it’s water resistant too. Its formula regulates the oils within your skin and the lotion is a safe choice for the sensitive skin as well. The smell is nice and not strong at all. It doesn’t last for long onto your skin, but it does soften the skin. Due to its formula, your skin remains protected for longer time so there’s no need to reapply it very often. It’s oil-free and non-comedogenic and safe for many skin types. We also like the lotion as it dries clean and doesn’t include PABA. It comes for an attractive price and it’s a valid option for the whole summer. Long story short, the lotion is a great option for the black skin over the summer as it protects against the UVs without leaving a white residue. Don’t let the thickness of the Nubian Heritage Lotion, Raw Shea and Myrrh mislead you as the lotion absorbs pretty well into your skin. As a matter of fact, the lotion presents a non-greasy formula that soaks right in into your skin. It’s made with unrefined African shea butter, but we’re also seeing plenty of other efficient ingredients. The list of ingredients also includes mango seed butter, cocoa seed butter, jojoba oil, soy milk and Japanese honeysuckle. All of the natural ingredients are certified organic ones which is why the lotion is safe for all skin types, sensitive skin including. The lotion is great for retaining moisture and to increase your skin’s elasticity. It works on a dry skin and doesn’t leave a greasy feel. It’s thick and creamy, but rubs well into the skin. A little goes a long way and the lotion leaves your skin soft and healthy glowing. It’s not sticky and its smell is nice. Let’s not forget to mention the lotion is paraben-free and comes for a good price. 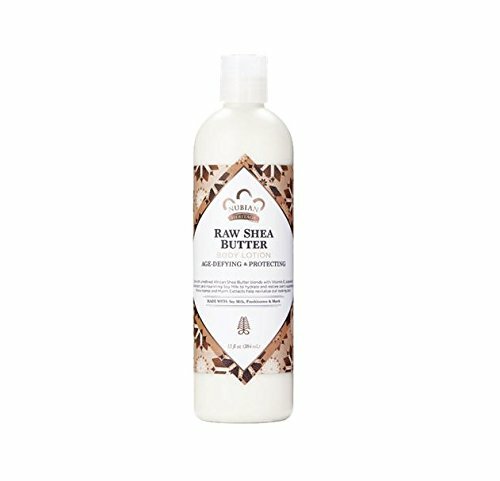 Nevertheless, the Shea butter lotion moisturizes the black skin without the greasy feeling and isn’t pricey at all either. 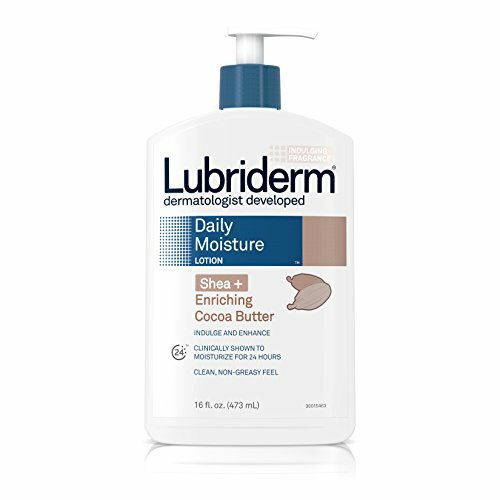 Even though it may be challenging for some to find its best place in the bathroom as it’s quite big, the Lubriderm Daily Moisture Lotion Shea + Enriching Cocoa Butter, For Dry Skin is worth every single penny and they’re not many at all either. The lotion comes in a 16ounce pump bottle so it’s very easy to use. The formula is made with shea butter and cocoa butter, nourishing the dry skin. The lotion moisturizes the dry and rough skin, without leaving a greasy feel afterwards. Strong enough to turn the dull and dry skin into a soft and nicely shiny skin, the lotion dries clean and leaves no greasy residue behind. Its consistency is rather lightweight so it soaks well and fast into your skin. The skin remains soft and smooth and the lotion leaves a luxurious feel onto your skin. It’s gentle for the dry skin and nourishes it, without the greasy feel. It’s safe to use it also on the face. The scent is a vanilla musky one, that doesn’t linger for long time on the skin. Its moisturizing effect is long lasting though. The lotion comes in a large recipient and it’s quite a bang for the buck too. It goes without saying that, for the money you’re paying, the lotion nourishes a dry black skin and smells rather nice, so it’s a good option for many.